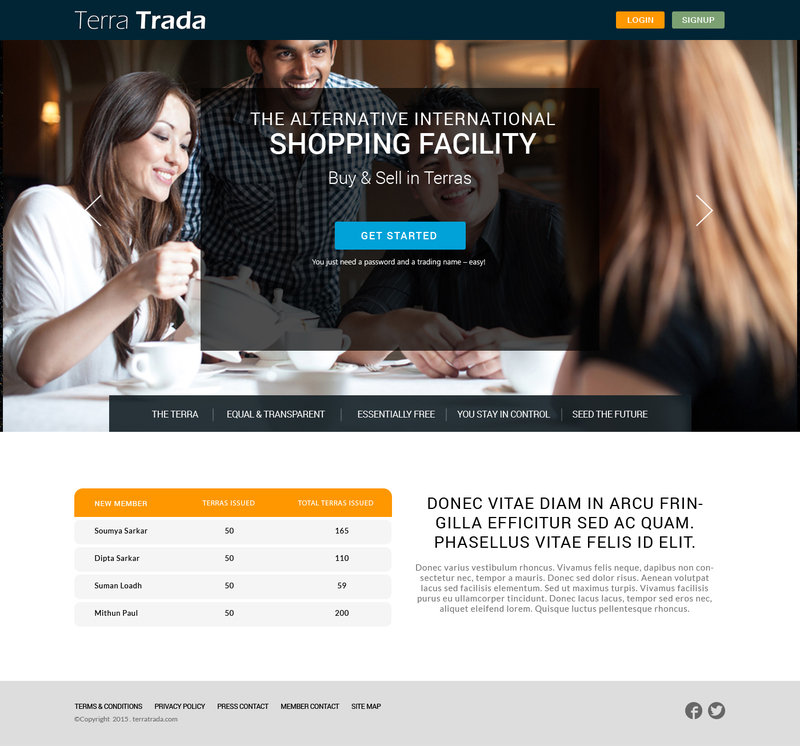 The TerraTrada project is to create a New International Economy that provides a global exchange facility, allowing members to exchange their goods and services via a Virtual Currency known as the TERRA. Although control is centralised, the accounting is highly visible to the general public. Nobody can 'buy in' and Terras are only issued in one way, which is 55 Terras for each new member introduced. So there are 2 ways to prosper with TT, namely, introducing others and selling products & services. We have produced a Sitemap for web/App development, detailed the unique buy process and produced the main content for the Terms & Conditions; all of which can be viewed by potential investors and or developers. In the first instance email me gary at terratrada dot net. The are no charges to members for the use of the TerraTrada exchange facility and all transations are FREE. There is no advertising beyond what each member can input for themselves, and this is also FREE. Nothing is hidden. The Terra is the name given to the virtual currency that is used as the medium of exchange within TerraTrada. It cannot be traded with other currencies or for commodities outside of TerraTrada; it can only be used to purchase goods & services from TerraTrada members. In order to get Terras into circulation, on a fair & equitable basis, each and every member who introduces new members, gets 55 Terras for each and every introduction. This is the only way new Terras are issued and this is clearly visible on the home page. We have designed a level playing field in so much as a person's financial status doesn't afford them any advantage or disadvantage over other members. Nobody can 'buy in' or 'sell out' or get any kind of privilege – period. There are no management fees or fees to trade or deductions of any kind. It is free to join and free to advertise your goods & services. You are responsible for your own delivery costs but these can be negotiated with your buyer(s). If you elect to purchase a 'Dispute Resolution' ticket, there is a fee for that because we have to pay mediators. You can advertise whatever you like as long as it's legal & moral. Because teenagers are allowed to be members, we will not allow any sexually explicit material or other material that is generally considered to be distasteful. Members who contravene our Terms & Conditions will be deactivated by us. TerraTrada is a trading facility that is aligned with the consciousness of TerraCharter – The People's Charter for Higher Conscious Living. The designer of TerraTrada is Gary Bate, who comes from a very ordinary working class family and was state educated. Gary is very much of the people and for the people. In creating an alternative global trading facility, we must be mindful that there will be 'old school' resistance and mindful that there are no limitations to how far TerraTrada can be developed without losing its values.